I was napping when I heard some heavy footsteps outside the bedroom window. 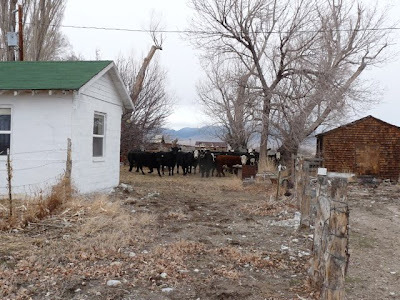 I figured I was hearing cows, because they've been in the meadow below our house. They are heifers (first time mama cows), recently arrived with their new calves. I hoped that they were outside the fence, but when I peeked out the window, I saw one in the yard. And then another. And then I went to the kitchen and saw the view above out the window. I grabbed the camera, because cows in the yard are usually a fun subject to photograph, and sure enough, this was no exception. 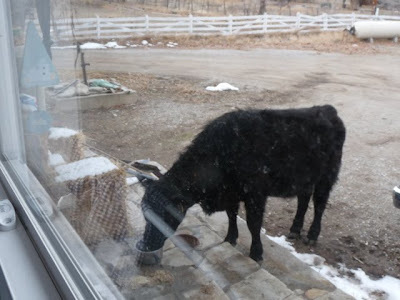 This heifer went up to Henry's water dish for a drink. Another heifer thought that might be a good idea. 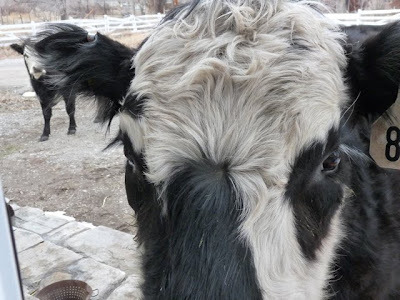 Hello, cow! It took her a moment to realize that she wasn't being invited in. Then she raced off the front steps and back into the driveway. The heifers had come in through an open gate, but they didn't want to leave by it. So I opened another gate and gave them some room (and made sure Henry was with me). 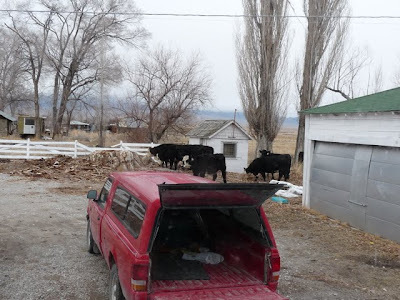 These heifers had come to visit because they were bored, but now they wanted to get back to their calves, so they didn't waste any time leaving through the gate and heading back to the meadow. I enjoyed my extra bit of afternoon fresh air walking around the yard. 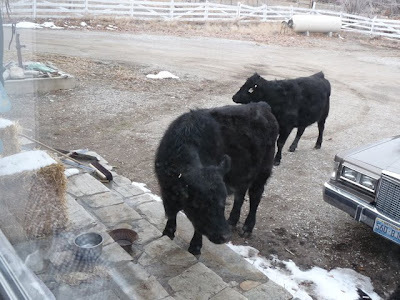 Now I've just got to watch my step a bit more, because there are some extra fresh, juicy cowpies decorating the yard! Watching the Olympics has our competitive juices flowing. Plus Desert Boy got a cute athletic outfit from his great-aunt and the weather has been better. Mix all that together, and we are raring to go outside! 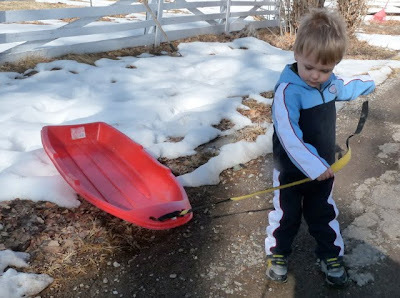 We offered Desert Boy the sled for his Olympic practice, but he declined. I guess he didn't think we had enough snow to make it work. 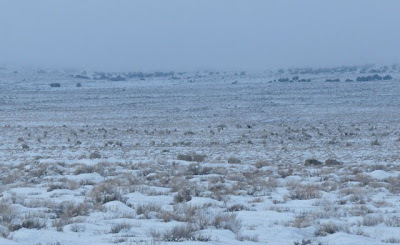 I don't have too many deep thoughts on this blog, but I figured it would be totally okay if Desert Boy was practicing for the Summer Olympics in winter, because after all it is summer on half the earth right now. And the sport he's practicing for is biking. It's still not apparent what kind of biking he'll be doing, but for now he's working on being king of the training wheel bicycle competition. 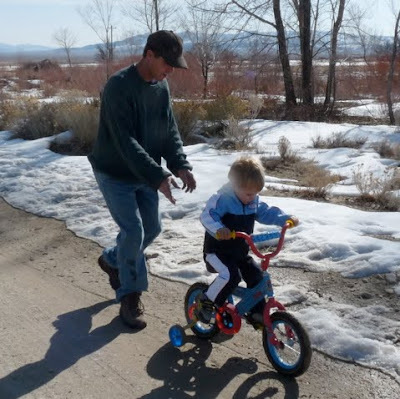 Here's a short video of Desert Boy riding on the pavement that's not too far from our house. 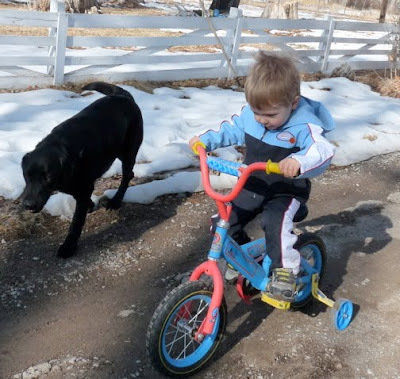 Getting to the pavement is a little tricky, but he's getting better at it. I wonder what the kids who live in the northern part of the valley do--some of them have to go over an hour to get to pavement. Yet they still have a school with grades K-12; those kids certainly have a different story about growing up than most everyone else in the U.S. In this second video, you can see some of the beautiful mountain scenery near us. It's always nice to see snow on the mountains--and have our roads down in the valley clear! We've been without Internet all week and it's driving me crazy! Here's a quick photo of Desert Girl--she has been a real sweetie and has helped keep me sane! Now I have to get back home and take care of her. Hopefully we'll get the Internet fixed in the next few days--I'm finding that I really crave it multiple times a day!! We've been continuing to have some Internet issues, so I wasn't able to post this yesterday. But better late than never--Happy Valentine's Day! I was craving some iced cookies (thanks to Faberlicious mentioning them a couple days ago!). 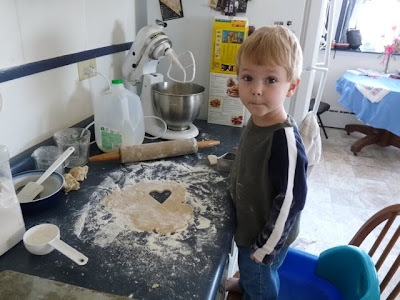 Desert Boy loves to help in the kitchen, so I mentally prepared for a huge mess and we began. He unwrapped the butter so we could melt it (since I never get it out hours ahead of time to soften), poured in the sugar and flour, and operated the mixer. 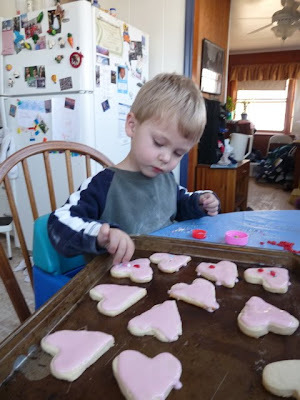 Then he took charge of the cookie cutter. 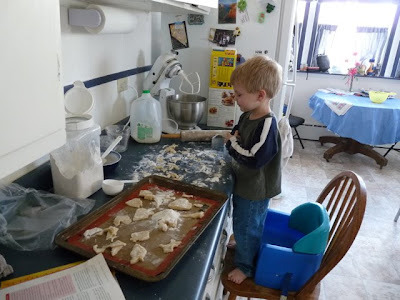 After we had baked a couple batches and had little bits of dough left over, I let him give it a try by himself. 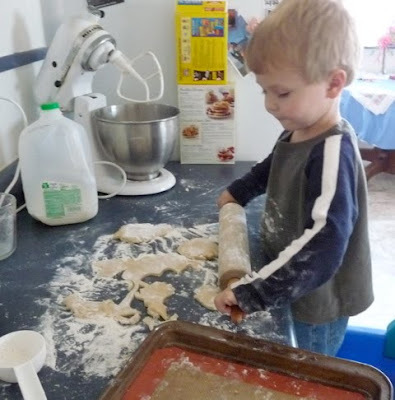 He tried rolling out the dough and doing the cookie cutter all by himself. The mess grew, but that was okay. It always does with cutout cookies! Here's his end result. 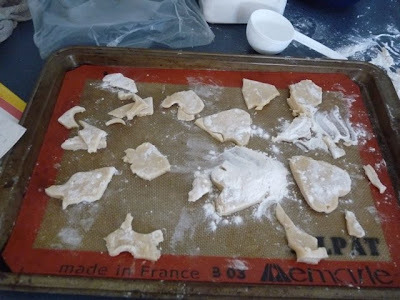 I managed not to laugh at the interesting shapes and tried to explain that we really didn't need to dump flour on the cookie sheet. Next came the decorating phase. Having had nieces and nephews help me in the past I knew that the most important thing about decorating is putting limits on the decorations. So I poured the different sprinkles into the lids, and told Desert Boy he had to use his fingers to do the sprinkling. He showed great restraint--much more than I anticipated. Usually one cookie ends up drenched in sprinkles and then there's nothing left for the rest. 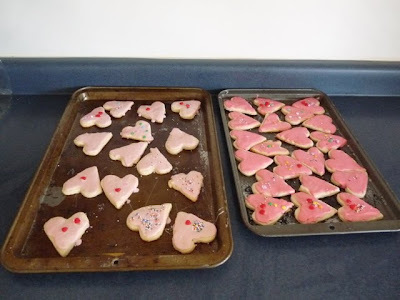 These cookies ended up tastefully decorated. 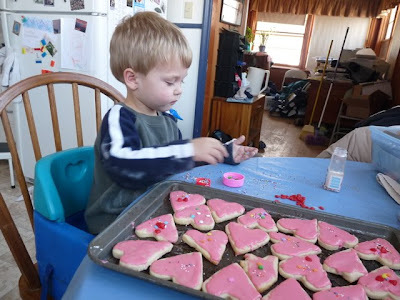 His attention span lasted to decorate all the cookies, another surprise. 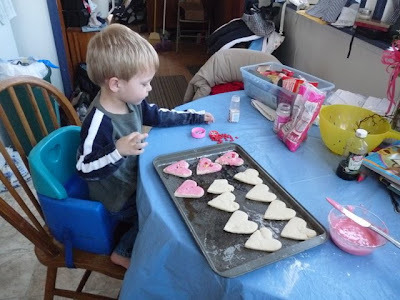 Although he did start eating the cinnamon hearts part way through the second cookie sheet. And here's our end result! Yum, they looked and tasted delicious. I'm sad to report that they're nearly gone. 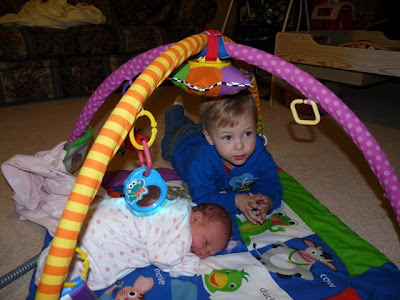 Desert Boy is slowly getting used to the idea that he has a little sister. 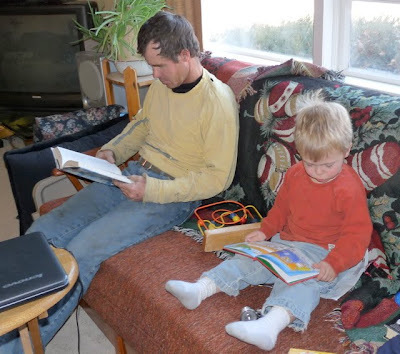 It's not been the easiest concept for him to grasp, especially leaving his only child status behind. 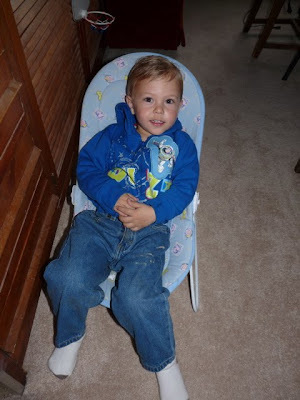 He's had to try out his old baby swing again. Fortunately it didn't collapse! He makes the bouncer seat look positively tiny. 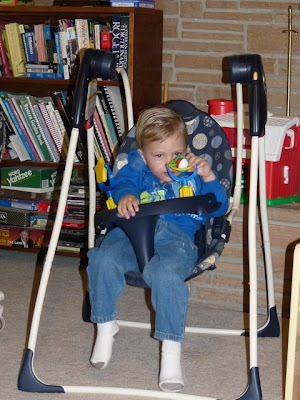 He also had to try out Desert Girl's car seat and pacifier. We've been trying to give him some extra attention, and when some friends brought over a wonderful dinner for us (thank you! ), it included a colorfully sprinkled cake. It was perfect for celebrating it as Desert Boy's cake. He likes to think every cake is his birthday cake, regardless if it's his birthday or not. So we humored him, stuck in a couple candles, and sang to him. 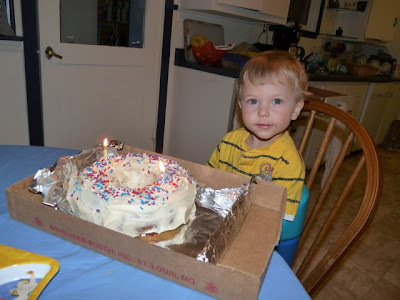 Then he blew out the candles and was very happy. 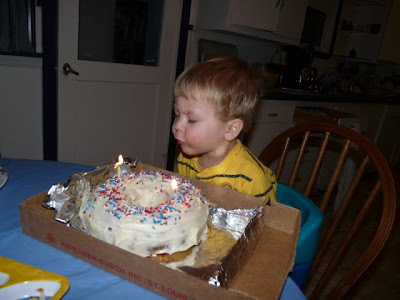 What's not to like about blowing out candles on your birthday cake. One of the things that's jumped to our attention is just how much Desert Boy has grown in 2 3/4 years. When we put Desert Girl next to him, it's obvious that he isn't a baby anymore (despite what he thinks at times!). Although they do tend to have some of the same moves. Some of their shared expressions and body movements cracked us up. Desert Boy likes to pose for the camera, so taking lots of photos is a way to make him happy! 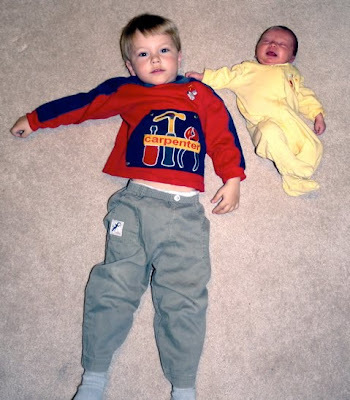 And maybe having a little sister is okay--or at least it will be in a few months when she can do what he says. 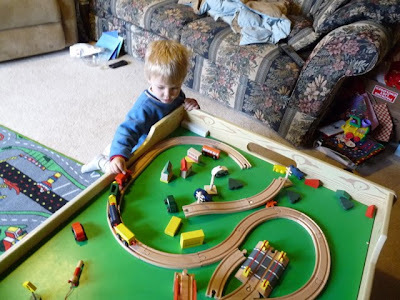 Desert Boy has been obsessed with trains for about a year now. Every time we go to a place that has train tracks, he gets excited, even if there aren't any trains running on the tracks. Fortunately we can usually find a few parked boxcars that will satisfy him. The only problem is that the nearest tracks are 65 miles away, so we have to make do with toy trains most of the time. 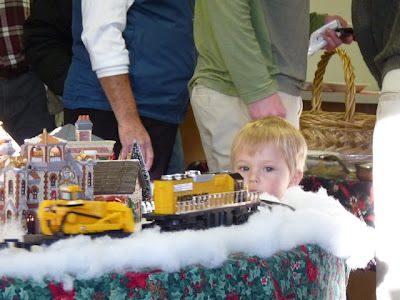 At Christmas, the Border Inn had a great little train set up, and Desert Boy wanted to go there every day to watch it go around and around. He would agree to do anything we wanted if the reward was to go out and look at the train. 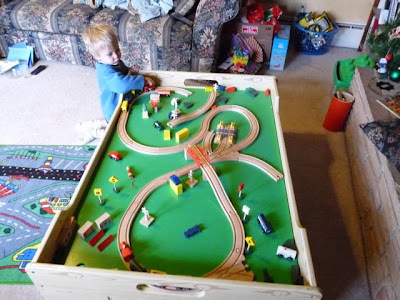 For Christmas he got a little wooden train, and he spends about an hour a day playing with it. I enjoy rearranging the tracks a couple times a week to keep it fresh. Sometimes the little town gets set up, but that's not the important part. Having the train go up and down and around and around is the important part. Desert Boy really likes to have someone play with the train with him. He'll pass off one train and say, "Here you go," and then take the other. 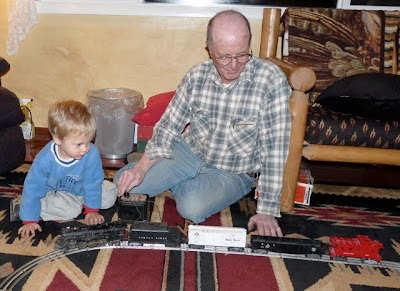 A super special treat was when Grandpa Dean took out his train at Christmas. Desert Boy couldn't get enough of it. 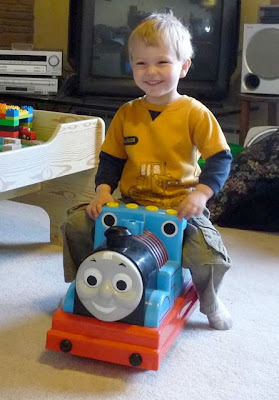 We found this cute Thomas the Train ride-on engine for $2 at the thrift store. Desert Boy insisted on new batteries so now I have the theme song in my head all the time. 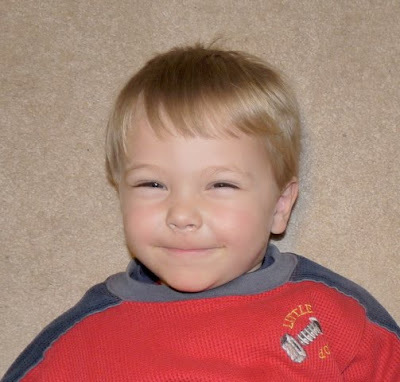 When it was time to go to the hospital to have Desert Girl, Desert Boy was happy to go to his cousins' house, partly because he knew he had a new train in his backpack. 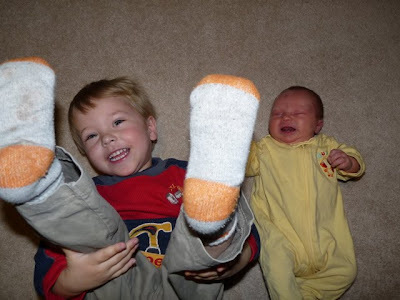 In fact, I think he might have been more thrilled with the new train than the new sister! 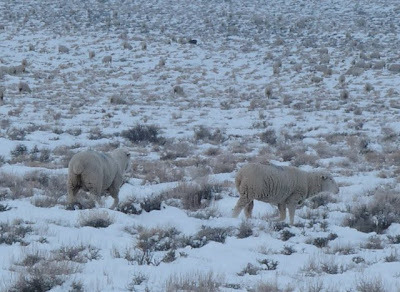 I was driving down the road the other day and was startled when I realized that out in the inversion there were not only ice-covered shrubs, but also little lumps of animals. Thousands of sheep were nearly blending in with the landscape. I really don't know why they all had their butts pointed at me. They just meandered about, finding their preferred food. 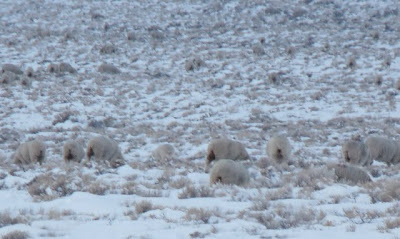 Sheep do particularly well at grazing in the desert in the winter because they can eat snow to obtain the water they need. One sheep was on the wrong side of the road, so we were able to get a nice closeup of it. Then it decided it didn't want our attention and ran off to join the others. 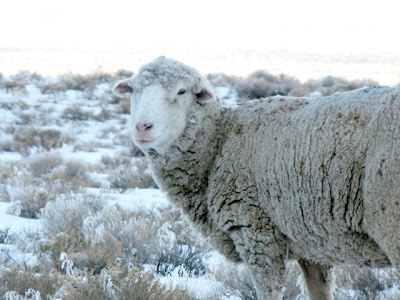 You can see how they manage to stay warm with that nice, thick wool coat on. I've been a little irregular about posting lately for a very good reason: Desert Girl! 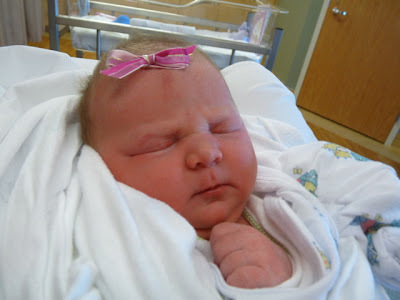 She entered our world February 1. It won't be long until she is following Desert Boy around trying to imitate him. 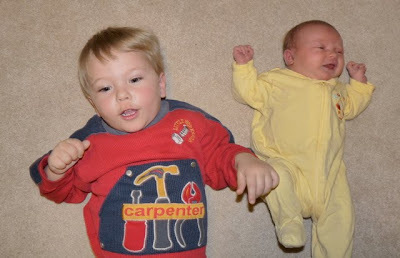 Our family is looking forward to more fun and adventures, and we thank you for visiting this blog to share them with us. 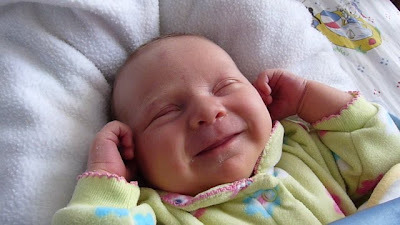 My husband was busy loading hay trucks for a couple days last week, with eighteen arriving. 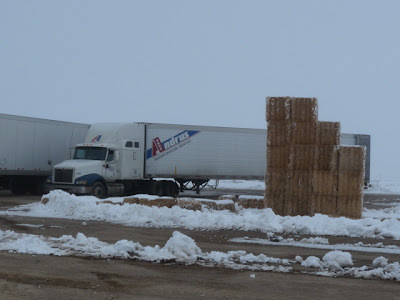 Usually hay trucks are flat bed trucks, but in this case, the trucks were the more common box trucks. That makes for some interesting challenges. 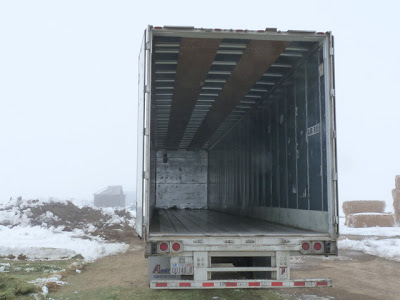 Here's the inside of an empty box truck. It's long, narrow, and only open on one side. 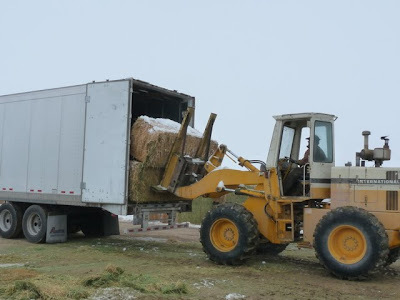 Here's my husband loading a couple bales of hay into it. They just barely fit width-wise. 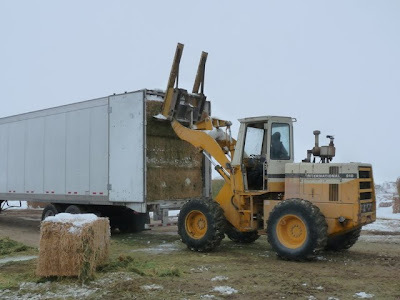 Then he adds the third bale on top. That one's tricky to get in just right. There's no space to spare, as you can see. 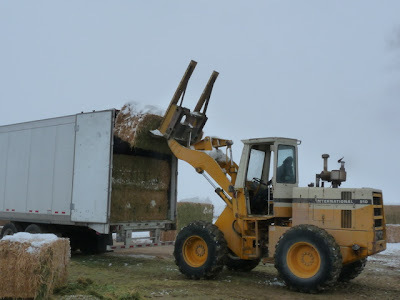 The next step is to push the bales back enough so that some more can be loaded. 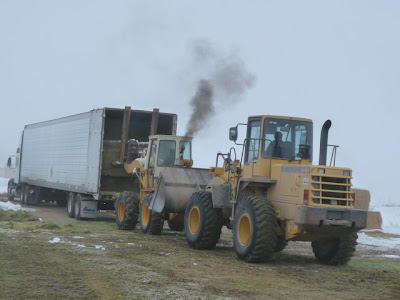 As the truck fills up, a second loader pushes the first loader to move the bales forward. 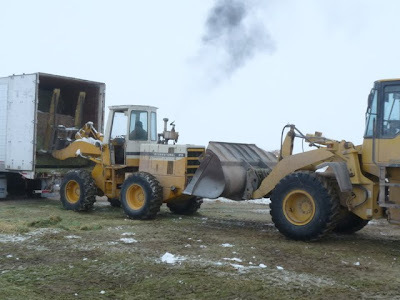 They keep pushing until the loader wheels spin. It's pretty amazing what can be done with heavy equipment. Here are a couple trucks waiting their turn. Then they'll take their backhaul and be on the road. I wish I could get a glimpse of how they unload the box trucks--that seems tricky as well.